Cookies are something you never grow too old to indulge in. Though I've developed more of a taste for savory things, that doesn't mean decadence has to be sacrificed along with flavor. I just use less sweetener generally in my treats and desserts with attention to more wholesome ingredients that contribute plenty of flavor in their own right. 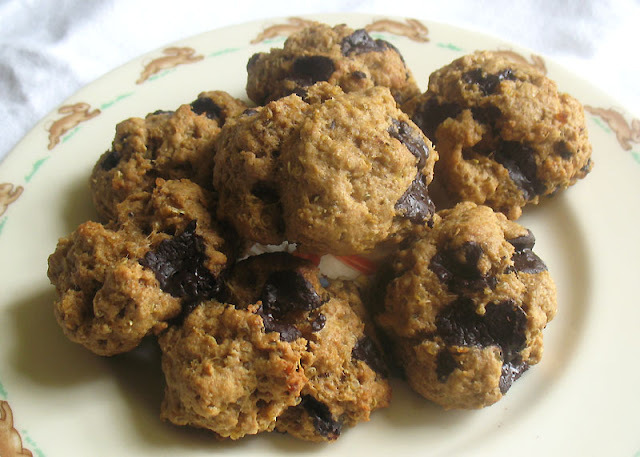 Enter quinoa cookies with fine dark chocolate chunks. 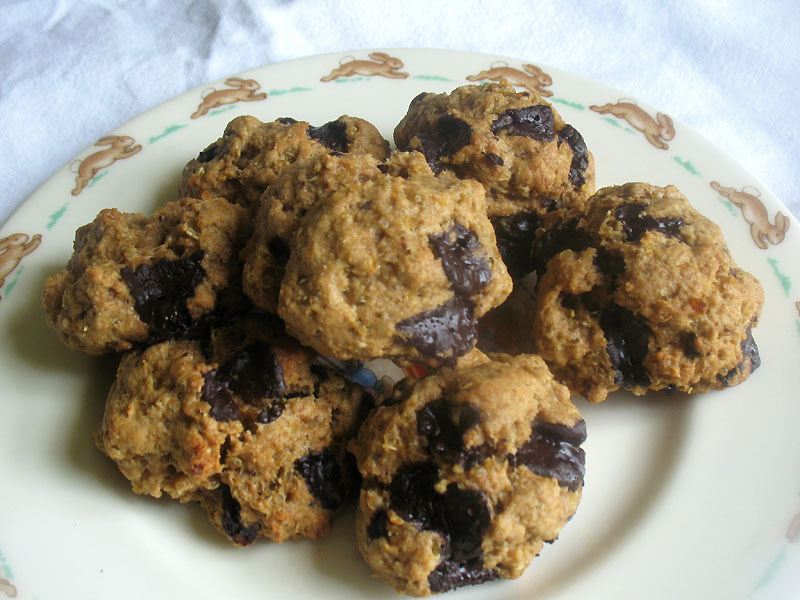 These chewy cookies are sweet, but now overly so, with the goodness of nutty quinoa complemented by the chocolate, some vanilla and a hint of almond extract. They are easy to make up and a good way to use up any leftover quinoa and, in my opinion, fine enough to grace any holiday plate too. Preheat an oven to 375° and line 2 baking sheets with parchment paper. In a medium bowl, whisk together the flours, baking power and soda and salt. In another medium bowl, beat the butter, sugar and honey together until smooth and light with an electric hand mixer. Add the eggs, vanilla and almond extract and beat for another 2 minutes. Mix the dry ingredients into the butter mixture a little at a time, and then stir in the quinoa and chocolate chunks until well combined. Drop small balls of the dough onto the cookie sheets and bake each batch for 12 to 15 minutes until golden. Transfer to wire racks to cool. I was thinking you used quinoa flour but am definitely intrigued to see that actually you mixed in cooked quinoa! I'm sure that makes for a great texture.